You may wonder if having your tile and grout cleaned is worth the time and money. Tile and grout cleaning could become timely and costly if you have a large square footage that needs to be cleaned. Maybe your wondering if cleaning it yourself would be cheaper than hiring a professional tile and grout cleaning company. Well it could be cheaper but the time and energy you would spend cleaning it to have minimal results may not be. When it comes to tile and grout cleaning San Antonio Beyer Carpet Cleaning knows what they’re doing. 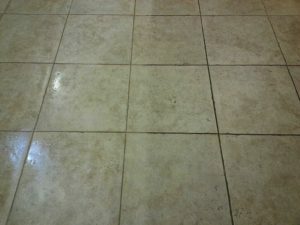 They simply don’t just clean the tile and grout they do a full tile and grout cleaning restoration. 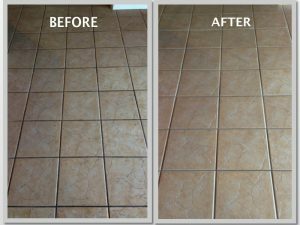 Their tile and grout cleaning will dramatically change the look of your tile and grout. If your grout was once white and is now black it will go back to white. This is a result that no amount of DIY will give you. Beyer Carpet Cleaning uses top of the line tile and grout cleaners that you cannot buy at a regular store. They put down an alkaline cleaner that is scrubbed into the tile and grout and then steam cleaned. All dirt and grime will come right up and be removed. You can’t imagine how much junk is within your grout until you get it professionally cleaned. Trying to get all that out on your own is nearly impossible. You might be thinking right about now what is this going to cost me? As mentioned above depending on the square footage it can get costly. 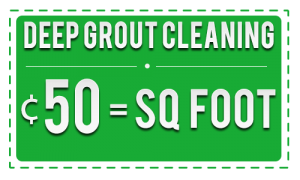 However, when most professional tile and grout cleaning companies are charging any where from $0.60-$1.00 per square foot Beyer Carpet Cleaning only charges $0.50 per square foot. Most homes only have a small amount of tile and grout which is usually located in the kitchen and restrooms so with their $99 minimum covering 200 square feet for tile and grout cleaning you can usually have your kitchen cleaned without it costing you much more. Don’t let the size of your tile and grout fool you. To the eye it may seem like not a whole lot to clean but once you are down on your hands and knees you will be wishing you called Beyer Carpet Cleaning. So skip the hassle and give them a call for all your tile and grout cleaning needs.